2. 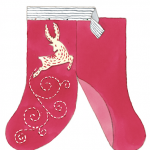 Trace the reindeer template on to cream felt, cut out and pin on to the stocking. 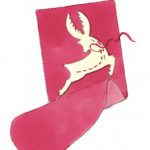 Following the stitch guide, embroider the decorative stitches – these will secure it in place. Using running stitch, sew the trail. 3. 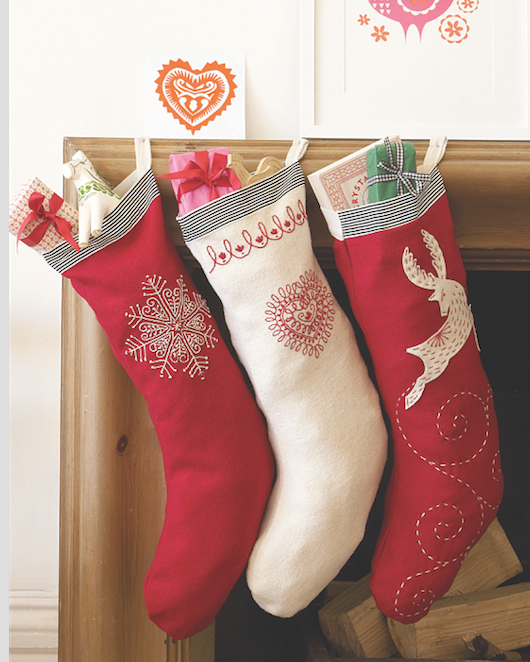 With right sides facing, place the front and back of the stocking together. Pin down the back seam until you reach the curve. Open up the stocking and pin the ribbon all along the top edge on the right side, overlapping the top by about 1cm (1⁄2in). Machine- stitch close to the bottom edge of the ribbon to attach it to the stocking. 4. Trim the ends of the ribbon level with the edges of the stocking. With the right sides together, fold the stocking back in half and machine-stitch all around the sides, 1cm (1⁄2in) from the edge. Trim the seam allowance to 5mm (1⁄4in) and turn the stocking right side out. 5. Fold the cream cotton tape or webbing in half lengthwise and pin it inside the stocking at the top of the back seam, leaving about 5cm (2in) sticking above the top of the stocking. Machine-stitch a line of zigzag stitches across the raw edges of the tape and just below the top edge of the ribbon to make the hanging loop.